It's time for another ISC Challenge! For this challenge were were to make anything using some Crackle Paints. For my project I started out with the Walk in the Woods plate. I stamped it in black on white card stock, then sprayed on some Color Wash Sprays, let it dry, then cut it into panels and mounted it on black card stock. The Film Strip is from Minibook Series: Photo Negative, I stamped it in Black on Gray card stock, cut out the punch outs with my x-acto knife, ripped the edges, then brushed on my Crackle Paint and let dry. The sentiment is also from this same plate. Would you like to play along with this weeks ISC Challenge and have a chance to win some FREE stuff? 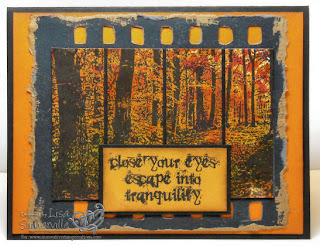 Simple - just create a card/project using and ISC images and Crackle Paint (if you don't own Crackle Paint, you can use the Cracked Glass Technique), then leave a link the ISC Blog for your chance to win 1FREE stamp sheet of your choice and 1 color of Crackle Paint. If you are loading to SCS - please use keyword ISCC18 so we can all see you work - but just a reminder you still need to leave a link on the ISC Blog. You have until November 23, to enter. Good Luck!